Panasonic Eluga C has been scheduled to be made available come December 5, 2017. Here, we've got the complete specifications as well as the price for the phone below. 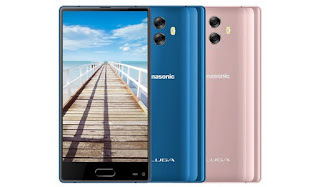 Panasonic Eluga C spots a 5.5 inch Tri-bezel-less screen display designed in a full aluminum frame. Runs on Android 7.0 Nougat straight from the box, powered by MediaTek MT6750T chipset coupled with a 4G of RAM plus 64GB internal storage. There's also support for 4G LTE connectivity, front-mounted fingerprint scanner, Dual rear cameras 13MP + 5MP with Dual led flash and 8MP front facing camera without flash. To keep the phone running, there's a non-removable Li-Ion 3,000mAh battery capacity. Full specs and price can be seen below. Price: $200 / €170 / NGN 71,000.